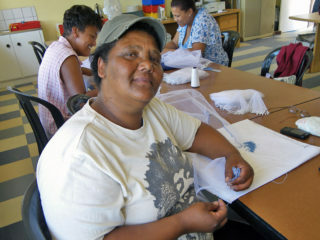 I am a widow and love working and learning with my friends at the Centre. We are very happy here in one another’s company, and we co-operate amicably and helpfully. So I think that we are still going to go far as a group with all our knowledge and skills. My family comes from here, and I have three children… one married, one studying at college, and my boy of 18 working to help support me. Sewing has always been a pleasure for me, so this I enjoy. I am just content with my life as it is, only looking ahead, and grateful for every day.